Longfellow's Bells of San Blas. A mural depicts the town of San Blas. The guys liked the cannons at the fort. led to a frigate bird rookery. A frigate bird chick huddles on its nest. brown booby on a cliff. Yep, those are blue feet. and tells me to go home. The flock waits for handouts from the fishermen. How we look after an overnight passage. north to Mazatlán. 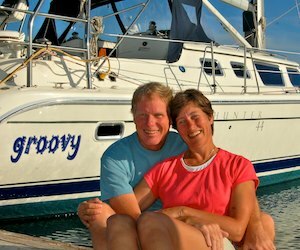 The winds were in our favor and we had two glorious days of sailing, stopping for an overnight at Isla Peña. humpback whale shoot straight up out of the water, turn, and fall crashing back down on its side. ideal spot to spend a few days. Longfellow's poem The Bells of San Blas. fading fast" while "the world rolls into light." the hill, and then explored the ruins of the "new"
San Blas was very busy on the day of our visit. photos taken for her "quinceañera,"
had been carefully orchestrated and must have involved more than one person. of shacks, and piles of fishing nets filled the space in between. the heart of a frigate bird rookery. an impossibly rickety little nest. one held a well formed chick that didn't make it out in time. signs of fear or of getting out of the way. calling them "tuxedo birds" because of the way they dressed. heads with a light face. booby. This one had blue feet! generally told us to back off. bird colony and back to the beach. found the coral snake rhyme online and discovered our little guy was a milk snake. boat could take advantage of the wind rather than the other way around. This entry was posted in Mexico's Mainland Pacific Coast (North) and tagged Mexico, Mexico's Mainland Pacific Coast (North), Shutterbug, Travel by Roads Less Traveled. Bookmark the permalink.